Yehudah ha-Levi (lived c. 1080-1141) was one of the greatest Spanish Jewish poets. He was born in Toledo, Spain while it was still under Islamic rule. He was a prolific writer of both Arabic and Hebrew poetry. He was also a physician and a philosopher. His writings are very diverse and cover such topics as love, friendship, religious devotion, hope, wisdom, and sorrow. "O My Lord, Your Dwelling Places Are Lovely"
Ha-Levi's most famous work is The Kuzari, which is comprised of 5 essays and was written between 1120 and 1140. The Kuzari tells how the king of the Khazars decided to adopt Judaism after consulting with apologists for the Christian, Islamic, and Judaic religions. The Jewish rabbi presented many persuasive arguments, and so the Khazar king decided to be circumcised and officially convert. According to Rabbi Eliyahu (the "Gaon") of Vilna, The Kuzari is "holy and pure, and the fundamentals of Israel's faith and the Torah are contained within." 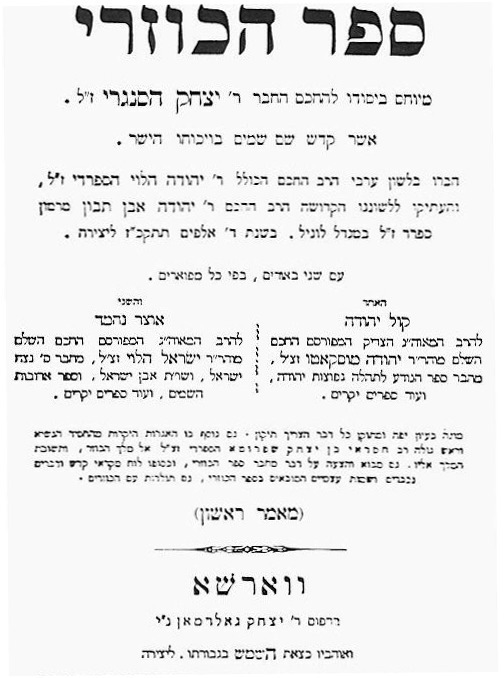 The Kuzari is popular worldwide and has been translated into Hebrew, Ladino, English, French, German, and several other languages. To create your own free homepage, visit Angelfire.